Who is dealing with the oddity of time travel with the greatest of ease? 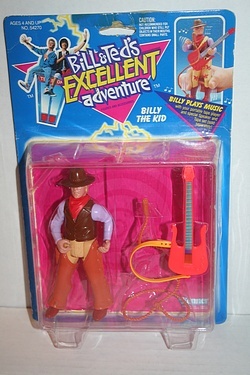 Why, it's Herman Billy the Kid of course! Just remember: what he wins, he keeps...what you win, he keeps, and he is also the last carded figure that was needed to complete the Preserve gallery of this line! Of course, I still need to keep an eye out for any prototypes: Napoleon, Talking Cruiser, Most Excellent Motorcycle Vehicle, Boom Truck or (gasp!) Historical Playset, but let's not all hold our collective breath. I'll settle for finding a nice example of the Snap Back Phone Booth, and I know that 2-pack is floating around the archives already, someplace. Click the image above for a few more shots, and for the bio of this most excellent historical personage!